Harvests late season - stores 8-10 months or more. 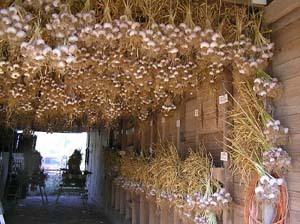 A long storing silverskin from France, Rose du Var is a bold and beautiful garlic. Its luxuriantly thick bulb wrappers are milky white and easy to peel. Peeling reveals cloves that are creamy colored with reddish-purple streaks with a full red blush near the elongated tips and between cloves. The backsides of the cloves are very red. The cloves are very satiny and the visual impression is of raspberries and cream, but the taste belies this impression. There are several layers of cloves and they all seem to be big as there are no small inner cloves - a chef's delight. If grown well, it should make a very nice braider as it is visually attractive, long storing and full flavored. The taste is typically silverskin - strong and long. If you want the bold taste of real French garlic in your recipes for continental cuisine, try this European pearl. Bulbs will average eight to twelve cloves per bulb and they grow and store clean.